It’s helpful to view the big picture of indoor air pollution. That way you can focus on those that are the most hazardous pollutants while developing a plan to rid your home of less deadly (but still serious) air quality problems. National Radon Defense is devoted to helping you make your home healthier. We are indoor air quality (IAQ) specialists who can prevent radon gas from entering your home and alleviate a host of other pollutants. We have the equipment to monitor your home for particle allergens, chemical pollutants, carbon monoxide, humidity, temperature, and carbon dioxide. Call us today or contact us online for an appointment to have your indoor air quality evaluated. 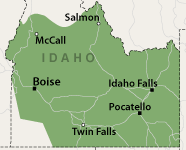 We are Central and Southern Idaho's leading radon and indoor air quality contractor serving Boise, Meridian, Idaho Falls, Pocatello, Nampa, Caldwell and nearby areas. National Radon Defense’s strategies for reducing allergens and particulates include dehumidification and the installation of electronic air filters in existing HVAC systems. Indoor air pollution includes airborne bacteria and viruses. Such contaminants are carried into the home by family members and pets. Infectious disease can include either bacterial diseases such as streptococcus, pneumococcus, and tuberculosis or viral diseases such as influenza, RSV, pneumonia, common cold viruses, and SARS. The health effects associated with this danger level are sinusitis, upper respiratory issues, throat and ear infections, bronchitis, and pneumonia. National Radon Defense highly-effective air filtration solutions can reduce the presence of viruses and bacteria in your home. Do you think you might have a radon problem or other indoor air quality problem in your home? Learn more about radon and radon testing and when it's smart to have a radon mitigation system installed. Give us a call at 1-888-370-6921 or contact us online to schedule an appointment for indoor air quality testing or radon testing in Nampa, Pocatello, Caldwell, Meridian, Boise, Idaho Falls, Twin Falls, Sun Valley, Hailey, Ketchum, Bellevue, Kuna, Jerome, Emmett, Blackfoot, Mountain Home and surrounding areas in Idaho.